That's been the case with Austin Hergott and for Beau Hoge a year ago. Both found themselves behind talented senior quarterbacks as juniors so they were not able to put together many quarterback highlights. Hoge mostly played wide receiver as a junior. But Hoge overcame the obstacle and landed a spot at Brigham Young University. Hergott just followed that same path as he verbally committed to continue his career as a quarterback at NCAA Division I Central Michigan University of the Mid-American Conference on Monday. Hergott becomes the fourth of the last five Highlands starting quarterbacks to continue their careers at the next level. Patrick Towles, a 2012 Highlands alum, is entering his fourth season at the University of Kentucky and 2014 graduate Drew Houliston signed with NCAA Division III Wittenberg University. However, injuries forced Houliston to stop playing football. The starting quarterback for 2012 in Donovan McCoy decided not to play at the next level. The Chippewa coaching staff sent an assistant to Highlands last fall and left a camp brochure. Dave Guidugli helped Hergott get in touch with Central Michigan Running Backs Coach and Recruiting Coordinator Gino Guidugli during the 9th Region Baseball Tournament a few months ago. Gino Guidugli quarterbacked Highlands to the Class 3A state championships in 1999 and 2000 before going on to quarterback the Cincinnati Bearcats. Hergott attended nine camps in 10 days including one at Central Michigan and another at Ohio State. Even if he's not looking to recruit them, Ohio State Head Coach Urban Meyer picks a handful and evaluates them during the camp and Meyer selected Hergott. Hergott impressed the coaches at Central Michigan and they ultimately made an offer. "This offseason has been work, work, work," Hergott said. "It's starting to show and coaches can see that. I had a few other schools talking to me. But Central Michigan was all in. That appealed to me." Highlands Head Coach Brian Weinrich called it new territory seeing someone be offered before the season begins. Gino Guidugli did not sign with Cincinnati until the spring of his senior year. He'd been committed to the University of Kentucky until former Head Coach Hal Mumme was fired. "Austin and his family have to do with what they feel comfortable with the school, the program and the coaches," Weinrich said. "We'll do our best to sell them. If they are interested, they're going to do what's best for them." 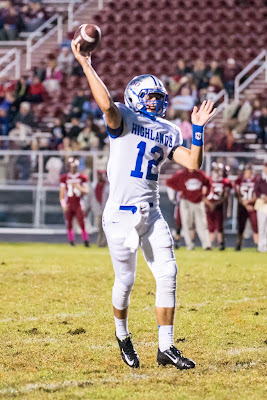 Hergott can now focus on his senior season as the starting quarterback for the Bluebirds. Patrick Towles was the last non-senior to enter the season as starting quarterback in 2010. "It takes a load off my back. I can focus on my senior year, which is the most important thing to me," Hergott said. "I'm not even worried about college football now. It should be fun going up there and seeing the players and coaches at CMU. But once the season hits, it's all Bluebirds until December." The Bluebirds finished 13-2 last season and won their seventh state championship in eight seasons and 23rd overall. That is tied with Louisville Trinity for the most in Kentucky history. "I just want to get out there, win games and have an impact on the season," Hergott said. "They need me and I need my teammates to win games. I can't do this alone. We definitely have the talent. We need to work hard and we'll be back to normal Highlands football standards." Hergott has worked to improve his footwork in the offseason. Hergott completed 8-of-23 passes for 74 yards, one touchdown and four interceptions last year. He admitted to not being ready to go in during last season so he's hoping to bounce back in a huge way. "That's the key with everything," Weinrich said of footwork. "Everything starts with the ground and works its way up. He in particular has taken a lot of pride and time to really fine-tune his footwork. It's made him a lot more effective throwing the ball." Hergott said the footwork is where it needs to be for him to succeed. He credits former Cincinnati Bearcat quarterback Tony Pike for working with him on that and his accuracy. Hergott hopes to take long strides using his 6-foot-5-inch, 220-pound frame. He did not rush for any touchdowns after going for several as a sophomore. But he knows the quarterback rushes add another dimension to the Highlands offense, especially talented running threats in Nick Kendall, Jared Pulsfort and Grant Murray by his side in the backfield. "It does motivate you to do well more so than if I had a good junior year," Hergott said. "I know I will prove people wrong because of all my hard work. I think it's going to pay off pretty soon." A big key for any spread offense is having the quarterbacks and wide receivers on the same page with the routes. Senior Mitch Cain is the leading returning receiver for the Bluebirds. Chandler New and Eric Miller also come back at that spot for Highlands. Cain had 28 catches for 464 yards and four touchdowns last year. "The receivers are doing well," Hergott said. "They're catching onto the routes real quick. We have younger guys getting into it too. It's looking real promising. We're throwing in more route combinations. It's going to be improved from last year because Coach Weinrich had a whole offseason and a whole new set of film to evaluate from last year. He's made a ton of changes." Hergott knows things will be tougher moving up from Class 4A to 5A. The Bluebirds have Grant County and last year's Class 6A runner-up Dixie Heights in District 6 along with the arch-rival Covington Catholic Colonels. There are a number of teams that expect to challenge the Bluebirds for the state championship. Defending 5A champion Pulaski County returns most of its team. If they make it back to the state title game, Bowling Green or Owensboro could be waiting. But Highlands will not have to travel several hours for a game this year. The furthest trip during the regular season will be to Scott County. The Bluebirds have played at Paducah Tilghman, John Hardin and Warren Central in the past two seasons. Their six non-district games come against 6A teams. "We plan to go out there and compete with everyone," Hergott said. "I'd rather have a close game with a 6A school than demolishing a smaller school like we've done in the past. The seniors that just graduated saw our schedule and were jealous. There's no other way I'd rather have it. You get to go play kids you hang out with instead of driving six, seven hours to face teams you don't have any familiarity with like the playoffs." Hergott comes from a family of Highlands football players. His older brother Brandon played wide receiver before graduating two years ago. Hergott said his brother made the summer roster at the University of Cincinnati as a walk-on but decided not to continue playing. "We've been playing together all the time every chance we could in the back yard," Hergott said. "He's a role model for me." Their father Kevin played tailback and linebacker in the mid-80s when Jack Eicher was head coach. Kevin Hergott played on the 1986 Highlands team that went undefeated in the regular season before falling 35-34 at Danville in double overtime in the second round of the playoffs. They have cousins who have played at other schools. Their mother is the former Kelly Traylor. The parents graduated from Highlands together in 1987. Kevin Hergott also ran track and played basketball during his high school days. But he wanted his sons to be internally motivated to play. "I'm not one of those guys who tells my kids to play one sport," Kevin Hergott said. "I want them to play as many sports as possible. You're only in high school once. Sports has been a big part of our family. They've wanted to be a part of that." Highlands scrimmages Cincinnati St. Xavier on Aug. 14 at home before opening the season on Aug. 21. The Bluebirds battle the Cooper Jaguars at 7:30 p.m.